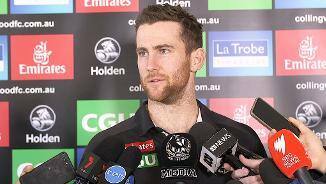 Collingwood star Jeremy Howe is optimistic about joining pre-season training by late January or early February as he recovers from shoulder surgery. Jeremy Howe says he will require post-season shoulder surgery. "The formula to be great"
Collingwood has the "formula to be great" despite Saturday's painful five-point Grand Final loss to West Coast, star defender Jeremy Howe has declared. Howe's eye-catching 100-game career with Melbourne came to an end when he was traded to Collingwood in October 2015. Although most know him as a forward, Howe showcased his ability to play at either end of the ground in 2016 when he ran fifth in the Copeland Trophy. The Tasmanian grew up a Collingwood supporter and idolised Nathan Buckley, while his cousin, Matthew Wade, has played 12 Test matches for Australia as a wicketkeeper. Aged just 26, Howe's best football is arguably still to come. 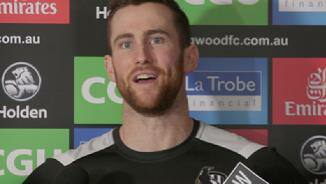 “I said I'd never play you in the backline, but I'm going to ask you if you can.” Those were the words relayed from Nathan Buckley to former Demon Jeremy Howe in mid-May. With defenders dropping like flies, it was time for the high flying forward to be swung down back. It proved a masterstroke for both player and coach, for the new recruit produced some of the best football of his career. He averaged career highs in disposals and marks and regularly trusted his laser-like right boot to turn defence into attack from the kick ins. Again spent time at either end of the ground, managing 10 goals, including a haul of three against Collingwood on the Queen's Birthday, as well as patch of marking excellence across half back later in the year. Howe took 34 marks in the space of three weeks between rounds 16 and 18, confirming his importance in Paul Roos' Melbourne line up. Was traded to Collingwood at season's end after notching his 100th match for the Demons in the final round of the year. The high-flyer made a slow start to the 2014 season, but got moving after round seven, playing as a spare in defence, using his ability to read the play and mark to great effect. Finished sixth in the best and fairest, but has plenty of improvement left in him. Obviously a great mark, he is leaning to become more dangerous when he has the ball in his hands. Melbourne has not discounted the possibility of playing him forward again in 2015. The high-flier started the season in good form, but was soon forced to plug holes as the team regressed. By season’s end he was struggling, but fought his way out of the slump with some old-fashioned emphasis on defensive pressure. His high marking has assured him a place in football history, but the 23-year-old has the challenge of cementing his place. He has the talent and will be better in a settled line-up when his role is clear. Once his confidence is up, he is versatile enough to play several roles. A super performer in 2012, Howe gave Demon supporters plenty of thrills with his acrobatic marking deeds. 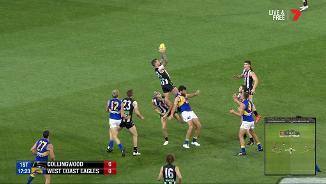 The high-flyer managed an incredible eight Mark of the Round nominations and was later awarded Mark of the Year. He finished fourth in the AFL for contested marks but it was not just his aerial skills – as outstanding as they were – that kept him at the forefront of thinking. Mark Neeld has earmarked him for the midfield but was forced to play him forward at times because of injuries. He prepares well, competes hard and worries the opposition on the ground and in the air. The Demons re-signed him for three years midway through the season. The high-marking forward drafted as a mature-age player made his debut in round 11 after overcoming an ankle injury early in the season. Howe looked to have more than one trick up his sleeve, kicking 18 goals and retaining his spot for the season. Many of his best performances came in a losing team and he won the club’s best first year player award. Combining his versatility with a strong work ethic allows him to play several roles. After another pre-season, he can be expected to impose himself on games even more. Interesting young forward from the quaintly named town of Dodges Ferry in south-east Tasmania. Was playing country football but progressed to the state league with Hobart in 2010 and showed he is a natural forward who likes to take a big mark. Has good skills on both sides of his body, is athletic and reads the play well. Represented Tasmania at the 2009 National Under-18 Championships. 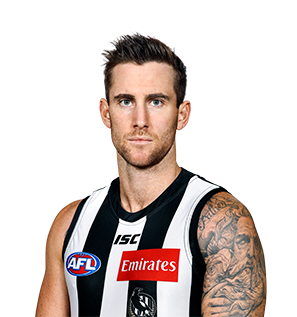 In October 2015, Collingwood, Adelaide, Melbourne and Port Adelaide were involved in a trade, which involved the Pies sending Paul Seedsman to Adelaide and Ben Kennedy to Melbourne in return for Jeremy Howe and pick 68 in the 2015 National Draft. In sending Seedsman to Adelaide, Collingwood received pick 32 which it traded on to Melbourne. The Demons then exchanged pick 32 and Jimmy Toumpas with Port Adelaide for picks 29, 50 and 68. Collingwood then traded Kennedy to Melbourne in return for Howe and pick 68.